« They laughed at my theories! The X axis is the score (0-64 at this point), the Y axis is the number of test runs (out of 10k) that achieved that score. 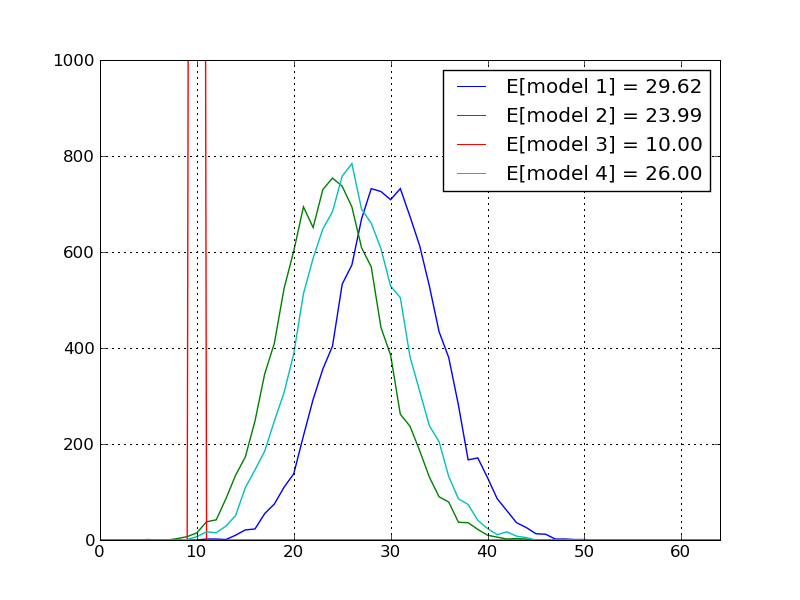 The number in the legend is the expected value (score) for each model. As you can see, my model had the [second] highest expected value. Choosing the top seeded team was the worst (guaranteed 10 points) best [see the 2nd update]. Choosing randomly was better than selecting the top seed the worst [see update] and my colleague’s model (cyan) was between my model and the random model. Not bad. I’ll update after the next two rounds of the tournament. Update: one interesting thing is that this suggests that there was still a lot of luck in my ESPN pick. Only about 0.5% of my model runs were as good as that one. Update 2: So, I’m lying in bed when it occurs to me that I’m an idiot… the team with the *lowest* seed wins a game in Model 3. This is why I say I don’t really know basketball. This entry was posted on Monday, March 22nd, 2010 at 9:09 pm	and is filed under Random, Technical. You can follow any responses to this entry through the RSS 2.0 feed. Both comments and pings are currently closed.